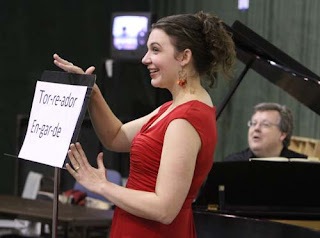 Today we hear from Andrea Reay, Seattle Opera's Production Administrator (pictured, right, at a pre-Carmen "Insider's Tour"; photo by Alan Alabastro). Andrea headed to France this week, where she'll be representing Seattle Opera at this year's Opera Europa conference, in Lyon. Read her first update, below, to learn more about Andrea's job, her travels, and what she hopes to accomplish while at the conference! If you would have asked me 10 years ago, when I took my first Production Assistant job with Seattle Opera on Eugene Onegin, if I thought I would ever consider traveling overseas for the Opera, I would have said you were crazy. I was 22 years old and totally committed to a career in stage management. I loved being in the rehearsal hall, close to the work, helping to make sure all the people and ideas came together on any given production. As I worked as a freelance stage manager in town I began to discover my true passion was in Production Management, where the work is every bit as integral to the success of the show as we strive each day to find creative solutions to practical problems. Many people may not realize that our costume and set rental program accounts for a significant amount of Seattle Opera's income every fiscal year. We have over 50 productions available for rent, and a large part of my job as the Production Administrator is ensuring that we meet our income goals. Ieva Ohaks, our Costume Rental Coordinator, and I work very closely to meet all of our clients’ needs and deliver the outstanding designs and craftsmanship that have graced our stage to other companies around the United States and the world. The rentals program allows our productions to have a life outside of Seattle, and for other audiences and companies to share in our success. The theme of this year's conference is “Sustainability, at What Price?” Europe is struggling with the same economic challenges that we face here in the U.S. It will be interesting to see the approach and models they are exploring to retain the art and maintain budgets. We'll be there to advocate for and facilitate rentals, which can be an artistically viable, less expensive alternative to other models. Opera companies all face economic challenges, but it's important to remember that every challenge is an opportunity—an opportunity to be innovative and creative problem-solvers, something that we do every day in the Production Department. So proud of my beautiful big sister! I know you will do an amazing job representing the Seattle Opera! Very cool - enjoy your trip to France. I am sure you must be proud of your success - what a terrific way to go through life. I loved what you said in your post. What an amazing trip! Can't wait to hear more about it!